Our laboratory in the Center for Musculoskeletal Research is also interested in structurally and biomechanically evaluating models of human skeletal disease (e.g. OA and osteoporosis), trauma (e.g. long bone fractures and critical segmental defects), and environmental toxicants (e.g. lead and cigarette smoke) using various wild-type and transgenic mouse models. These musculoskeletal phenotyping studies utilize non-invasive imaging using 3D quantitative micro-CT and biomechanical testing among other techniques. 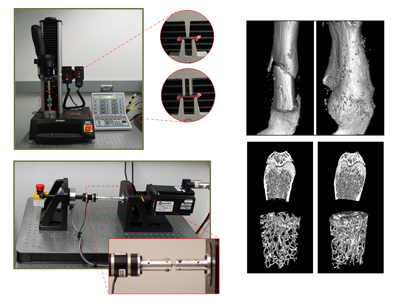 Phenotypic characterization of bone includes biomechanical evaluation using 3- and 4-point bending and torsional testing, as well as micro-computed tomography imaging of bone structure. Researcher: Hani A. Awad, Ph.D.